The latest issue of HOUSE BEAUTIFUL features designer Sheila Bridges‘ New York City kitchen. 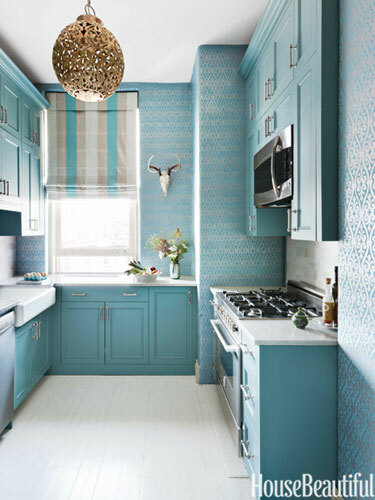 This is a very striking and unusual blue for a kitchen. Bridges’ Torino Damask wallpaper is gorgeous and does make the space seem larger. I love how the silver in the wallpaper works with the stainless steel appliances. It’s funny to me how this is described as a small kitchen. True, it is much smaller than the kitchen in Bridges’ Hudson River Valley home, but by NYC standard, this kitchen is pretty decent size. To see more of the kitchen, the HB slide show is HERE. ha! This kitchen is HUGE! 🙂 Love it. The editors at House Beautiful must know that most NYC apartments (in Manhattan!) tend to have very small kitchens. Yes, if this were a house out in the ‘burbs okay, I’d say it’s small. i love it! the wallpaper is stunning. Isn’t it? Would love to use it for a future project.